Jesus Christ said, “You shall know them by their fruits.” You will not know a prophet by how many followers he has. Or how much property he purchases. You will know him by the prophecies God reveals to him. God will also give him a powerful work to deliver those prophecies. The Bible refers to “that prophet” declaring his message just before Christ returns. He is prominently mentioned in the former prophets, all of the major and minor prophets, plus Lamentations, Daniel and Revelation! Can we prove who he is? I believe this message will have more impact than any booklet we have published. It will also bring more persecution! Remember, God reveals prophecy only to “babes” (Matthew 11:25). 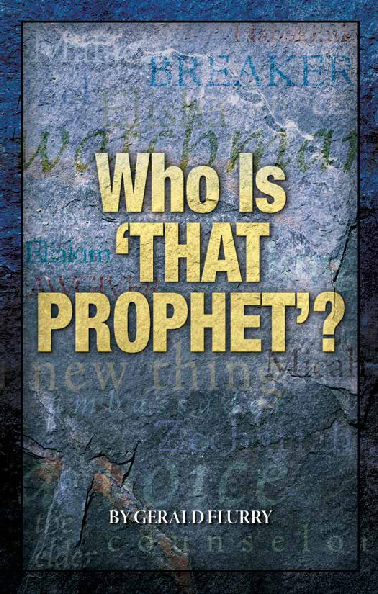 If you will prayerfully study this booklet, asking God for a humble, childlike attitude, you can prove the identity of that prophet.